USDCAD has been struggling below the 23.6% Fibonacci retracement level of the upleg from 1.2060 to 1.3663, around 1.3285 over the last seven days, following the bearish rally from the 19-month high of 1.3663. The price also remains below the simple moving averages (SMAs) which are turning lower, signaling a bearish crossover in the near future. In case of further downside pressures the pair could run towards the next immediate support level of 1.3160, increasing chances for a deeper negative correction. Even lower, if the price fails to hold above the aforementioned level, it could re-touch the 38.2% Fibonacci of 1.3050, which overlaps with the support level taken from the lows on November 7. 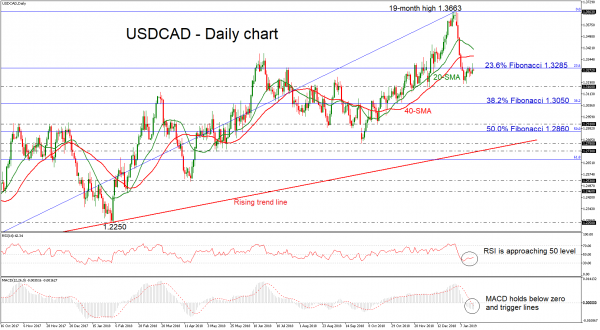 To sum up, in the bigger picture USDCAD has been developing in an ascending tendency since September 2017, while in the short-term, bears have taken control for some correction.